At Slicktext.com, we’re all about compliance. If you’re not following SMS marketing best practices, you simply won’t experience long term success. On top of that, poor practice could easily result in account suspension. This is definitely something you want to avoid, as bouncing back from this unfortunate circumstance is highly unlikely. Here’s a few things that will destroy your credibility, and result in account suspension. You fail to respect the original stated frequency. You originally promised only four campaigns a month, but instead you’re firing out seven. This might not seem like a huge deal to you, but if this practice continues, it will result in account suspension. You fail to provide proper HELP and STOP instructions. 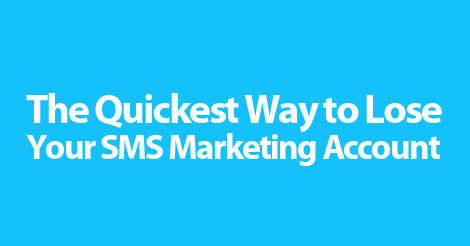 You can’t force subscribers to stay on your SMS marketing list. Stay credible by giving them proper opt out instruction. And chances are, if they want to unsubscribe, it means they weren’t that qualified to begin with. As long as you’re not observing a rapid opt out rate, there’s nothing wrong with a few opt outs here and there. If people aren’t interested in your product or service, you simply don’t want them on your list. You don’t promote your terms and conditions. At the bare minimum, you must provide a shortened link to your long form terms and conditions. Not only is this good practice, it’s also a legal requirement. Never try to pull the wool over on your subscribers. Be 100% transparent, as this will ensure you only gather qualified and interested leads. Partner up with top online texting service, Slicktext.com. Give us a call today a 1.800.688.6290 to learn more, or hop over to our pricing page to sign up for a free plan. Our feature rich platform helps the small business owner diversify on their marketing efforts, and reach maximum potential. If you’re overwhelmed by the idea of SMS marketing, head over to our learning center, and comb through each educational resource. The more you know, the better you’ll do.